MH370 Days Counting – footsteps…….. It is coming to 2 month since MH370 went missing and to date there is still no concrete sign that the aircraft ended in the South Indian Ocean. Surface search and underwater search still did not find any clue in any form. Even the few pings detected by the SAR team did not turn out to be from the ill-fated aircraft. The best of the worlds latest technology even fail to give us answers. And now Malaysia and MAS had made into the record book. While news about the misisng MH370 is fading by day, the SAR team is still determined to unearth where the wreckage (if there is) and what really happens. Now, the public’s interest to follow the latest development is getting cold by day unlike during the earlier days. Likewise perceptions on how Putrajaya handles the tragedy has is also being questioned. Merdeka Center had conducted a survey to find out how the public sees. 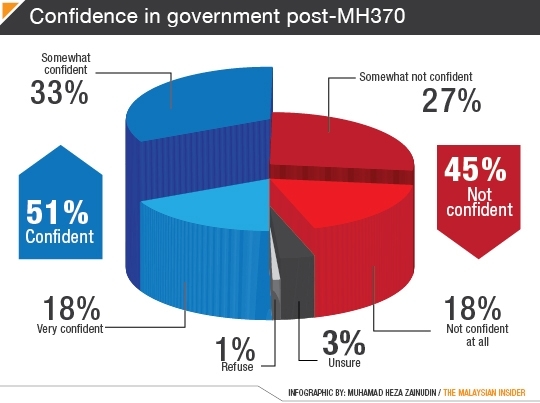 The result was 45% were not confident in the government handling and 18% not confident at all. Merdeka Center director Ibrahim Suffian said while Putrajaya might be doing its best to handle the tragedy, the numerous conspiracy theories as well as the slow release of information from the authorities had contributed to the negative perception. Whatever the public’s perception towards Putrajaya, we should still pray for the fate of MH370. Lets hope miracle happens and MH370 did not end in the South Indian Ocean because there is no tell tale sign that it ended there besides the PM announcement. All search resulted null.